Home Education AHF Hits New Milestone: 1 Million Lives in Care! LOS ANGELES–(BUSINESS WIRE)–AIDS Healthcare Foundation (AHF), the largest global AIDS organization, which celebrated its 30th anniversary in 2017 and now operates in 41 countries, is honored to announce that it has surpassed a remarkable milestone in its history: as of the start of this month, AHF is now providing HIV/AIDS medical care and/or services to more than one million patients—1,004,228 patients worldwide as of last week—in the US, Europe, Africa, Latin America/Caribbean and Asia. And AHF’s Africa Bureau, one of AHF’s five global bureaus, leads the way, with over 500,000 HIV/AIDS patients in care in the 13 African nations that AHF serves in. 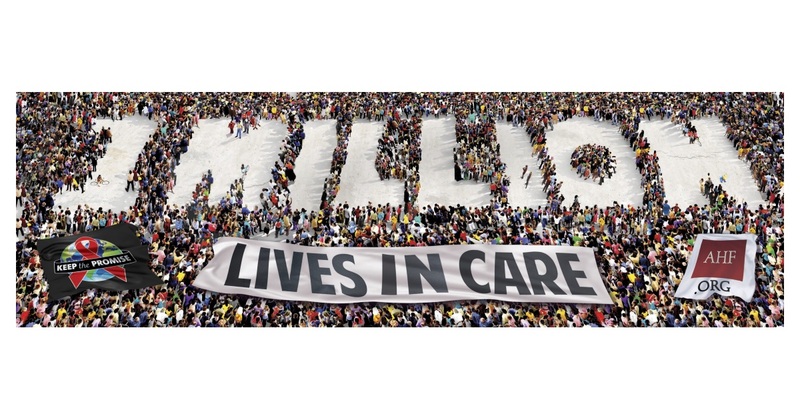 To mark its one-million patient milestone, AHF will roll out a celebratory new ‘1,000,000 Lives in Care’ billboard campaign later this month starting in Los Angeles and later, in South Florida. The campaign will also be shared with some global countries and sites. The inspiring artwork, created by Jason Farmer, Senior Director of AHF Worldwide, features an image of white numbers making up ‘1,000,000’ on a backdrop of a crowd of thousands and thousands of people giving the billboard an artistic pointillist effect—one that underscores and heightens to concept on one-million lives now under AHF’s care. In addition, AHF produced a short video marking the one-million patient milestone. To view, click here. AHF began operations in 1987 as the AIDS Hospice Foundation by a group of activists in response to the urgent need to provide hospice services to patients dying of AIDS on the streets of Los Angeles. By July 1990, the organization had changed its name to the AIDS Healthcare Foundation, as the need for ongoing medical care for HIV/AIDS patients grew. When the advent of lifesaving antiretroviral medications ushered in a treatment revolution in 1996, AHF began supplying these medications to patients for free without guarantee of reimbursement and at great financial risk. In 2002, at the invitation of local South African activists, AHF opened its first free HIV/AIDS clinic outside the U.S. in this hard-hit country. In 2004, AHF declared its pledge to reach 100,000 people worldwide with its services, and by 2009, AHF reached that major milestone. In addition, AHF operates 63 free HIV/AIDS healthcare centers in 15 states and the District of Columbia and the U.S. Territory of Puerto Rico, including in California, Florida, Georgia, Illinois, Indiana, Louisiana, Maryland, Mississippi, Nevada, New York, Ohio, Pennsylvania, Puerto Rico, South Carolina, Texas, Washington [state] and Washington, DC.